Revamp dull, dingy tile floors with the help of our grout and tile cleaning services. Our East Hanover, NJ cleaning crew draws on years of experience and high quality cleaning products to make your tile shine like new. With the help of our advanced grout and tile floor cleaning staff you can keep even the tiniest nooks and crannies spotless and sparkling. 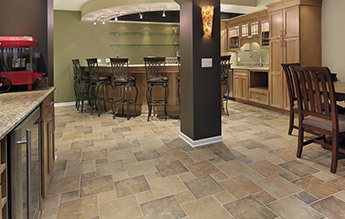 During our tile and grout service, we use the same innovative system as our carpet cleaning. With high temperatures and expertly formulated products, we power wash your floors. This allows us to completely remove the top layer of buildup, leaving your tile and grout looking fresh and uniform in color. In order to leave your floors looking good as new, we also offer a sealant for grout lines. With the application of our long-lasting sealant, your newly cleaned grout will be much easier to maintain. *Valid for wall to wall carpeting only. Cleaning of exposed carpet only. Rooms over 200 sq. ft. and combined living areas are considered two rooms; adjustments may be made at the time of cleaning. Contact our office for additional information.